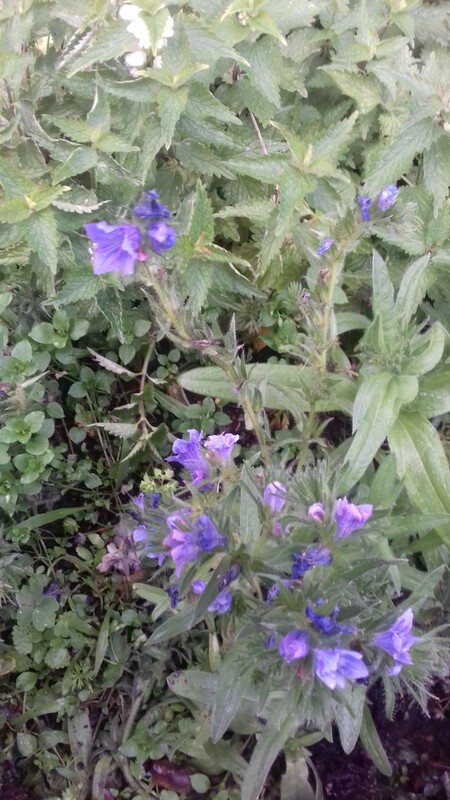 Last year, we wrote about the problems of finding, growing and using bedding plants, and were a bit dismissive of the ‘Blue Bedder’ echiums we’d tried growing; they were very slow to get going in the first place, took a lot of coaxing to establish when we’d planted them out in the gardens, and grew very straggly. True, once there were a few flowers it was clear they were real bee magnets, but what with the very cold weather at sowing time in March and April, and the drought, we didn’t plant them again this year and forgot about them completely. Until this last month, that is, when I noticed that we had more of them than we’d had all last year, and after the couple of half-days’ rain we had in early October, they’ve been flowering well and attracting a lot of bees on warmer days. The clear blue flowers are very welcome amongst all the dying-off perennials – they’re small flowers and don’t look out of place, just cheerful as the colder weather sets in. They must be self-sown, as they’re growing mainly around the places the preschool children planted them in last year; those plants died off in the autumn, so it’s unlikely these hardy annuals have suddenly come back after nearly a year. Definitely one to try again next year, probably just sowing direct rather than raising under cover and then transplanting. Here’s another one that’s appeared in my front garden in Mardle Road, just behind the gardens, together with some white deadnettle that’s clearly had a new lease of life with the rain. There’s quite a bit of this and the smaller red deadnettle in the beds at the Memorial Gardens, as they’re very attractive to bees, and flower and look good more or less all year. We just cut off spent flower stems, and a week or two later there are new green shoots, even now, in early November. A very useful and attractive pair of plants. This entry was posted in Uncategorized and tagged bedding plants, deadnettles, echium on November 7, 2018 by foe.